All my life, I have chosen Singapore Airlines (SIA) as my default choice of airline to fly. Not simply because I am patriotic (I am! ), but because SIA is one of the world’s leading carriers with excellent service. However, we have chosen to fly with Japan Airlines (JAL) for our upcoming trip to Japan. The following are my reasons why. In May 2017, we were already aware of Corey’s allergies to eggs, dairy and peanuts when we booked our flight with SIA. I did everything a food allergic mum usually does. Our allergist wrote a letter to declare his allergens. I emailed the letter to SIA and requested a special meal void of eggs, dairy and peanuts. I was promised an allergen-friendly baby meal. But what we were given was a baby food jar containing dairy. Even when I had specifically said no dairy allowed. Thankfully, I was able to check the ingredients as it was bottled baby food, so Corey did not eat it. It is unimaginable what could have happened if he did eat it. For a long time after, I did not entertain any more thoughts of flying with Corey. I was glad that SIA stopped serving peanuts after the anaphylaxis incident in July of that same year. I shudder to imagine that could have been us instead. It is sad that a serious reaction had to happen to bring about the change. SIA removing peanuts was a sign of positive change, but it did not compel me to start holiday planning. For one, satay sauce and peanuts on nasi lemak is still being served in business class. For our own reasons, young Corey had not been exposed to tree nuts yet, so I was not keen to explore more risk at that point. Then, a chance conversation with fellow allergy mum Vanessa gave me some hope of travelling again. Vanessa had travelled to Tokyo at the end of 2018. and had glowing reviews of the way JAL handled her daughter’s severe food allergies. “JAL has full allergen-free meals!” She told me. They even printed out a coloured photo of the meal for her to carry on board, so they can verify that was the correct meal. Vanessa is by far the most detailed allergy mum I know. 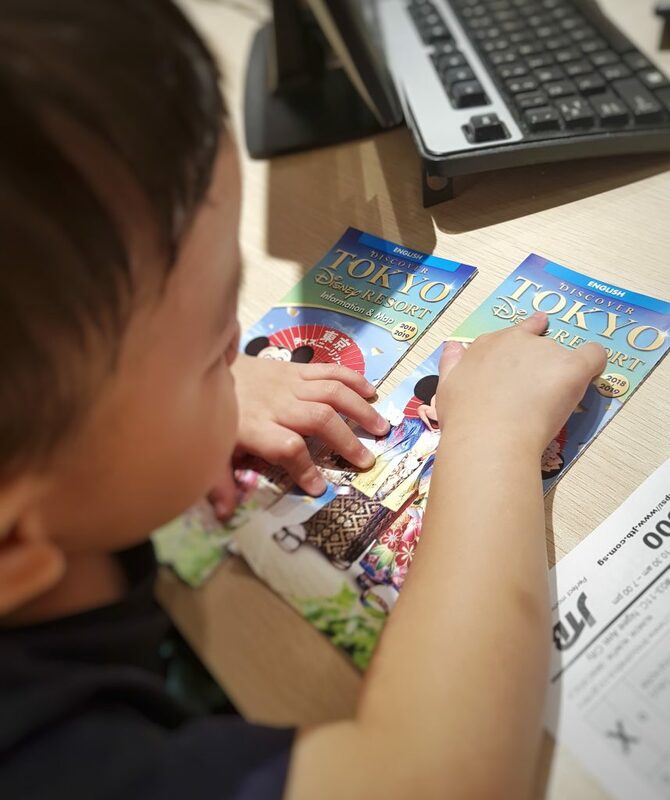 Inspired by her positive experience, I decided to book JAL flights to Japan for the family. True to Vanessa’s word, I was accorded the same detailed care when I approached JAL about Corey’s allergies. The JAL’s customer service office is based out of Hong Kong. Naturally, I was concerned with communication issues in explaining Corey’s unique allergen requirements. It did take some time to explain my predicament but that had more to do with our difference in English accents than the subject discussed. In fact, once he heard that my son required an allergen-free meal, he quickly booked him an “27 allergen-free meal”. Additionally, they would do extra cleaning of our row and 3 rows in front and behind us. The officer also said that we will be presented a letter to confirm the seat cleaning had been completed at the point of check-in at the airport. There was no fuss, no immediate general disclaimers. I did not have to resort to extremes to get my point across. No dramatics which I usually have to employ in emphasizing that for Corey, it is a life and death issue as far as his food allergies were concerned. So I got a good feeling from JAL. They not only met my minimum expectations of understanding the needs of travelling with a food allergic child, but they also exceeded my expectations even before I have boarded the plane. So off we go on our first air flight in 2 years. So here we are hours away from Corey’s new travelling adventures. We have yet to board the flight so the jury is still out on the actual experience. I guess we’ll have to see what happens and I’ll report back later. But if the care accorded to us thus far is a benchmark to go by, my impression of JAL on catering for food allergies inspires confidence. This is an airline who is familiar with food allergies and have put in place certain protocols to cater to these special needs. In July of 2017, a peanut anaphylaxis incident on an SIA flight finally spurred the airline to sit up and make changes. A lot has changed since then but is that enough? SIA continues to earns top honours as best airline by many critics. And I am still a huge fan of SIA for their service delivery in many aspects of air travel. Except when it pertains to food allergies. I had a look at SIA’s special meals on their website. It boasts a pretty extensive list of special meals. From baby post-weaning meals to diabetic meals and even gluten intolerant meals. SIA seems to have put together a wide range of fancy special meals. But no allergen-free meals that are void of the top 8 . WHY?? Part of the problem is that the allergen declaration is not a mandatory law in Singapore. In Japan, it is mandated by law to declare their top 7 allergens, and highly recommended to declare an additional 20 ingredients. I did a search on ANA the other Japanese carrier, and they too had 27 allergen-free meals. No doubt laws compel businesses to act. Maybe we are only in the infancy stages of the food allergy epidemic seen in other first world economies. But this also means we have a head start in increasing allergy awareness. While I wonder why more is not being done for the growing food allergic community, life must go on. I know that ultimately, the responsibility of keeping Corey safely away from him food allergens falls squarely on my shoulders, whether an airline has allergen-free meals or not. But it definitely takes away a huge amount of stress when an airline like JAL has safe meal options for my food allergic son. So I’m looking forward to our new adventures. Excited for Corey to experience a full in flight meal without me having to stress over it’s contents!